German BND foreign intelligence agency's conclusions on the alleged downing of the Malaysian Boeing crash in eastern Ukraine can be interpreted in a way that implicates Kiev in the crash, as mush as the local militias, a senior Russian lawmaker said Sunday. Ukrainian search groups will examine the crash site of Malaysia Airlines flight MH17 in eastern Ukraine in order to collect the remains of the bodies and personal belongings and to hand them over to the Dutch side, Reuters has reported citing Dutch television. 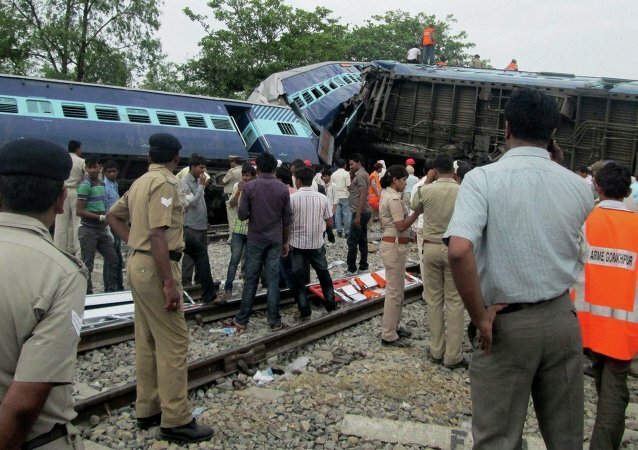 At least 12 people were killed and 45 injured after two passenger trains collided in India’s norther state of Uttar Pradesh, AFP reports citing local officials. Malaysia's defense minister expressed concern Monday over the security of experts at MH17 crash site ahead of the next expert team's visit to Ukraine. A preliminary report on the Malaysia Airlines flight MH17 crash in eastern Ukraine is expected to be issued on September 9, Dutch Safety Board spokeswoman Sara Vernooij told RIA Novosti Thursday. A crew member of the Poline vessel, which overturned in the Sea of Japan, has died and another is missing, though the rest of the boat’s crew have been rescued, Vladimir Pisklov, an aide to the head of Russia’s far eastern Primorsky Territory seaports administration told RIA Novosti Thursday. A Russian MiG-31 “Foxhound” jet has crashed near the city of Armavir in the country’s southern region of Krasnodar, with both its pilots surviving, Russian Defense Ministry spokesman Igor Konashenkov said Thursday. The helicopter that crashed in South Sudan Tuesday had a crew of Russian citizens, three of them died, UN spokesman Stephane Dujarric said. Russia is planning to request an official report on the progress of the investigation into the crash of a Malaysian passenger plane in eastern Ukraine, Russia’s UN envoy Vitaly Churkin said Monday. The Malaysian Boeing plane that crashed in eastern Ukraine in mid-July, could have been brought down by an air-to-air missile and a cannon of the Su-25 fighter that had been “shadowing it,” The New Straits Times reported on Wednesday citing experts. A group of 10 American military has arrived in Ukraine to investigate into the crash of a Malaysian Boeing 777, which was downed in the country’s east in July, Reuters reported, adding that the team would not visit the crash site. Ten people died in a traffic accident involving a logging truck in Russia’s Leningrad Region on Saturday, officials said. Safety violations may have been to blame for the crash of a high-tech military attack helicopter in Moscow this week, investigators said Wednesday. A Russian military helicopter crashed Tuesday afternoon in a district on the edge of Moscow, injuring the two pilots on board. Pilot error caused the crash of the Antonov An-2 biplane that came down in Russia’s Ural Mountains last June but was uncovered only in May this year, Russia’s Interstate Aviation Committee said Tuesday. A light plane crashed in Russia's Siberian republic of Yakutia (Sakha) during a performance at a festival, killing a pilot and injuring two on the ground, local emergencies said on Sunday. A passenger ship with at least 56 people on board has collided with a barge in Siberia on Saturday, killing eight people and injuring 47, including eight children, Russian emergency services said.